A beautifully crafted silver and rose gold ring, set with glittering white topaz stones and elegantly designed with contrasting coloured hearts for a romantic feel. All Clogau Welsh jewellery contains a touch of gold mined from the Clogau St David's gold mine - the very same gold used in generations of royal jewellery. 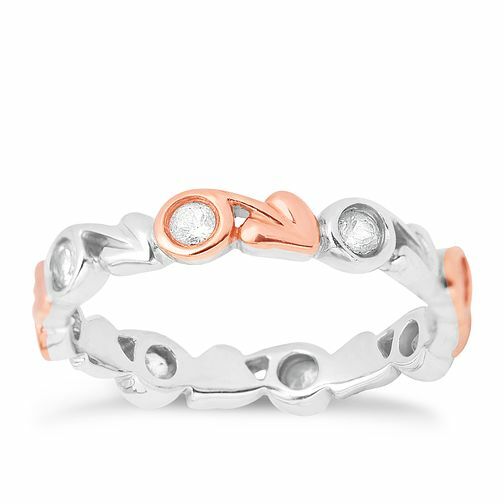 Clogau Silver & Rose Gold White Topaz Ring is rated 1.0 out of 5 by 1. Rated 1 out of 5 by Anonymous from Disappointed Purchased this for my 40th birthday present with some gift cards Id received as presents, but was so disappointed after finding a stone missing after only wearing the ring for 8 days! Was no problem in taking it back to return the ring for Clogau to inspect / repair / replace, but I am gutted as Clogau normally create such beautiful jewellery - hopefully I'll have no further issues when it is returned...estimated return date is 3 weeks time!